There was a modest and God-revering woman named Angela. She had no male child, but four daughters. 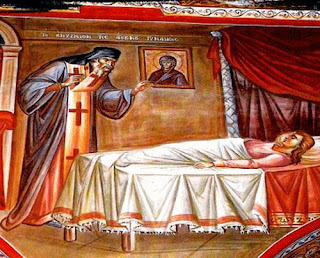 She was greatly distressed at not having given birth to a son and spoke of it on several occasions with some of the Saint's pious kinswomen. She heard them recount the extraordinary miracles taking place on a daily basis through the Saint. After listening to these accounts, she was inspired to invoke the Saint with faith. She did indeed believe unhesitatingly and began calling upon the Saint with fervent tears that through his intercessions she might obtain a male child and be consoled. 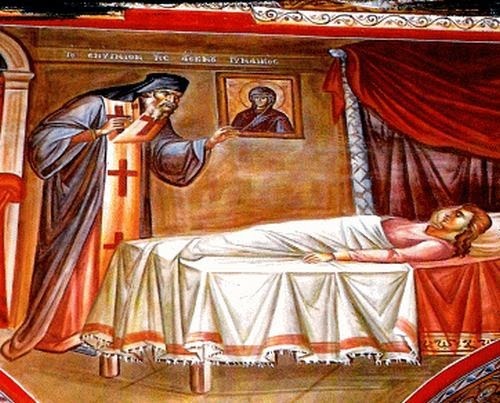 She entreated the Saint many times for his assistance, until one night, while asleep, she beheld a certain hierarch who said to her: "What do you want of me that you so often beseech me? If you want to obtain that which you desire, send to the Strophades the herb known as marjoram, with another herb which is found behind the holy bema of the main church. Make a drink from these herbs and you shall give birth to a male child." The bishop then blessed her face and vanished. When Angela awoke, she straightway sent a message to a sister of hers who was at the Strophades. The sister quickly carried out the task and went to Angela with the aforementioned herbs. Angela, with reverence and ardent faith, prepared the drink and partook. Not much time passed before she conceived and gave birth to a son, named John, who came to be well-grown, kind and skillful.